At the age of just 15, Juliette Joseph has ridden more horses and jumped more jumps than most riders twice her age. As a full-time working student for Robyn Stiegler of Citrus Hill Farms in Rancho Santa Fe, Calif., Joseph puts in long days doing all of the typical tasks that working students do—setting jumps, helping around the barn, grooming lots of horses, and riding, sometimes as many as seven horses a day. But that is just the beginning; Joseph then has to spend several hours completing schoolwork assigned through her University of Nebraska online high school homeschooling program. This weekend, at the ASCPA Maclay Region 8 Championships during the Blenheim Fall Tournament (Calif.), Joseph not only qualified for the ASPCA Maclay Final but also was awarded the Shelby Drazan Memorial Award, a scholarship granted to “an individual that has displayed sportsmanship, integrity and passion in the show jumping arena as well as in the community.” It was the culmination of an emotional evening, which also included a retirement ceremony for a former equitation mount, Vigo, owned by Stiegler. Joseph’s eyes teared up when they announced her as the winner, an unusually outward display of emotion from this seasoned competitor. The scholarship will give Joseph, who lives in San Diego, funding for roundtrip air and ground transportation for one horse and equipment to compete at the fall indoor shows as well as $2,000 towards the Dover/USEF Medal entries at the Pennsylvania National Horse Show in Harrisburg. The award is given by the Drazan family together with H.E. “Tex” Sutton Forwarding Company in memory of Shelby, herself a former equitation rider. 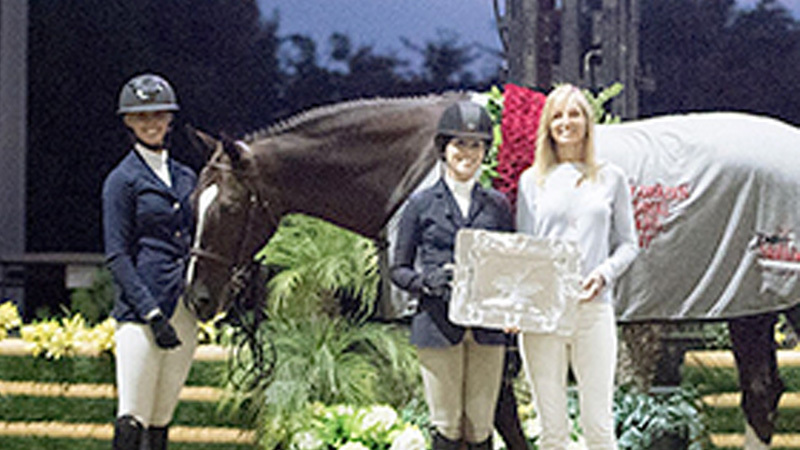 The award comes after what has been a long nine months of transition for Joseph, who is still 14 in horse show years. A dedicated rider since the age of 6, when her grandmother gave her a birthday present of riding lessons, Joseph’s passion allowed her skills to progress at an almost meteoric rate. She soon began showing extensively in classes ranging from ponies to children’s medals to low level jumpers before starting in some 3’6″ eq competitions about four years ago. This year will be her second trip east to compete in the finals, but the first without the support of her mother, Rachel, who passed away unexpectedly in January of this year. It has been three years since Juliette has owned her own horse, so many of her rides have belonged to clients of trainers like Nick Haness, Archie Cox, Liz Reilly, Emily Esau and Carleton Brooks, in addition to those with Stiegler. Juliette’s most recent partner in the equitation classes, Hudson Bay, is owned by Breanna Bunevacz. Juliette showed him in the Region 8 ASPCA Maclay regional and qualified for the Final. Juliette qualified for the Dover/USEF Medal Final on him in early September during a two week window while Bunevacz was out of town; that was the only other time she has ever competed him. “I am so grateful that Breanna was willing to share him with me again for regionals,” said Juliette. Stiegler says that this was the last year of finals for Juliette in the 12-14 age category, and in one round of recent California medal championship, her horse refused a fence. In discussing the ride afterwards, Stiegler told Juliette that she thought the horse might be sore. Juliette chose to not continue to compete because it wouldn’t be right for the horse.